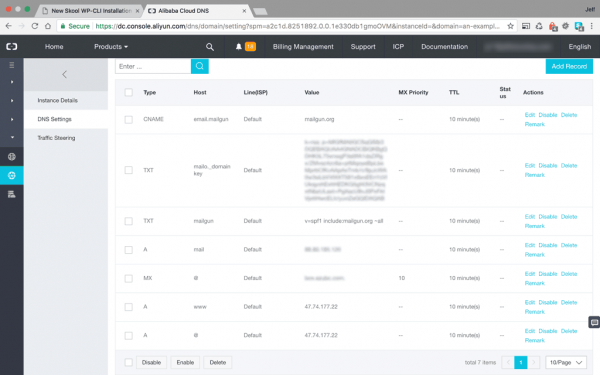 So here we are… The final part of our series, our Alibaba Ubuntu 16.04 ECS instance is ready, we have NGINX, MariaDB, and PHP7 completing our stack. 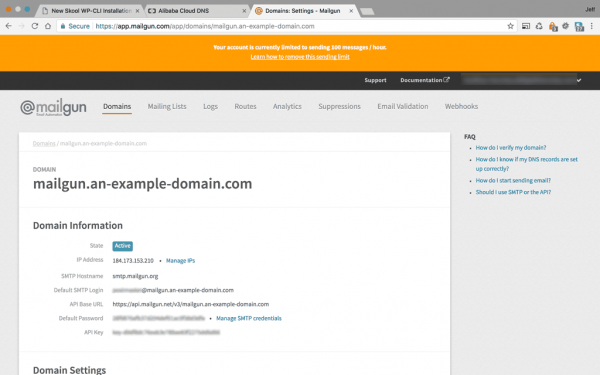 Our domain is configured and our site is protected with a Let’s Encrypt SSL certificate. We are all ready to install WordPress, happy days! Completing the previous tutorials is a prerequisite for this one, so if you haven’t completed them yet, then follow the links above and come back here when you’re done. I would also be remiss to not point out, again, that most everything in this tutorial will work on most cloud providers. Within the server block we need to add some locations blocks. We also need to make some adjustments inside the location / block. Previously we only installed the minimum PHP extensions required to get PHP to communicate with MariaDB and NGINX. However WordPress and its myriad ecosystem of plugins often leverage additional PHP extensions for increased functionality. We will install some of the most popular ones next. This step is optional, you could install these as and when you need them, but since we are already tweaking the LEMP stack for WordPress, why not do these now? Now PHP and NGINX are ready, we just need to add our Database with MariaDB and we can move on to WordPress. 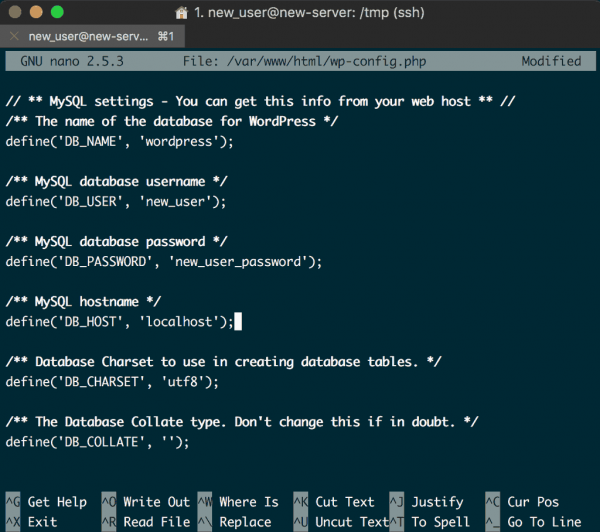 WordPress needs a MySQL Database to store site and user information. In the previous tutorial we installedd MariaDB as a drop in, more performant, replacement for MySQL. 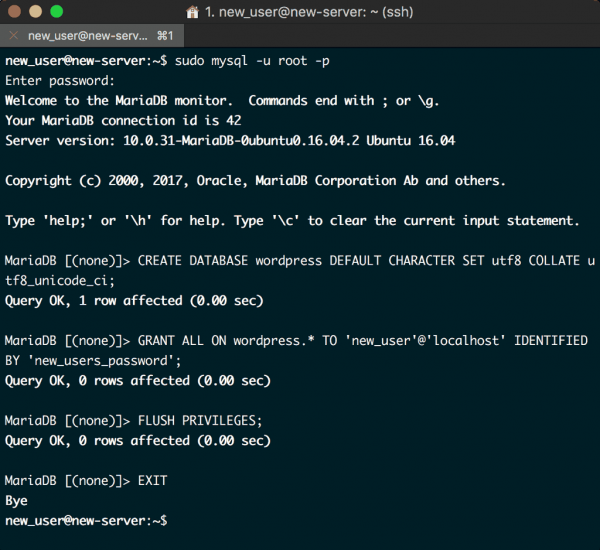 Now we need to use MariaDB to create the Database and User for WordPress to use. As usual, you will need to enter your superuser password before you can progress. 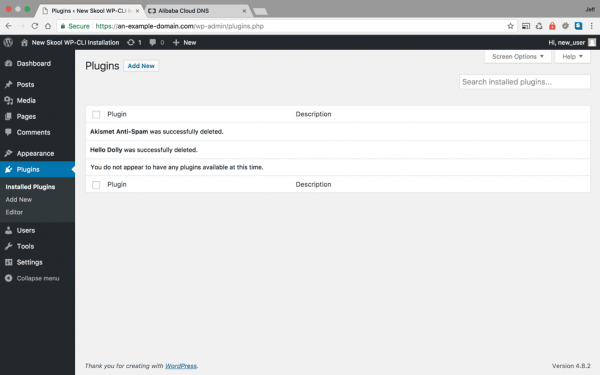 If we try to import the WordPress files in this directory immediately, then we will receive a permissions error. That is because this directory currently belongs to root user in the root group. 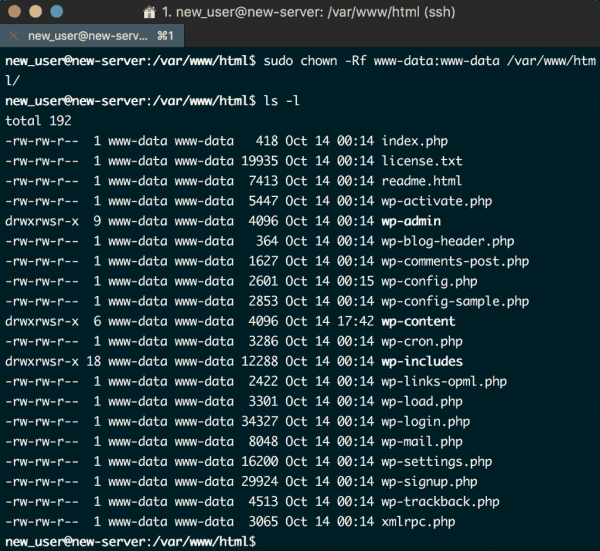 Your terminal will display the file and directory permissions, owner, date, time, and contents. You should see root root in the output. We will need to change the owner of the directory and the group the directory belongs to, in order to allow us to write the files we need within. We will be revisiting this directory and its ownership once we have installed WordPress, as it currently stands we won’t be able to install themes and plugins once WordPress is up and running. We can do that later. Wait… you have a decision to make. 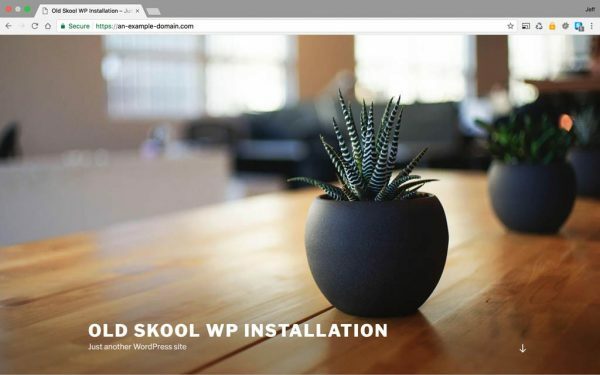 This tutorial is going to show you two ways to install WordPress. The first is the original way, using curl and editing config files using nano etc. It is trusty and reliable method, and worth going through. The second is using WP CLI, the awesome command line interface for WordPress, if you haven’t used it before then this is your chance to start. It’s awesome, and, once you get used to it, you can use it to manage all your WordPress sites with a workflow that offers such increased speed and efficiencies that you will never look back. 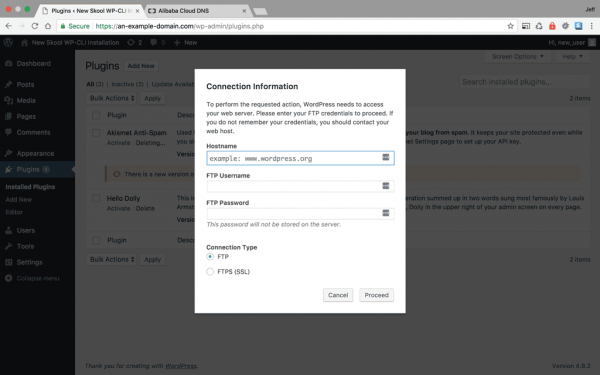 We need to configure some settings in the wp-config.php file so WordPress can talk to our database, and also to secure the installation. 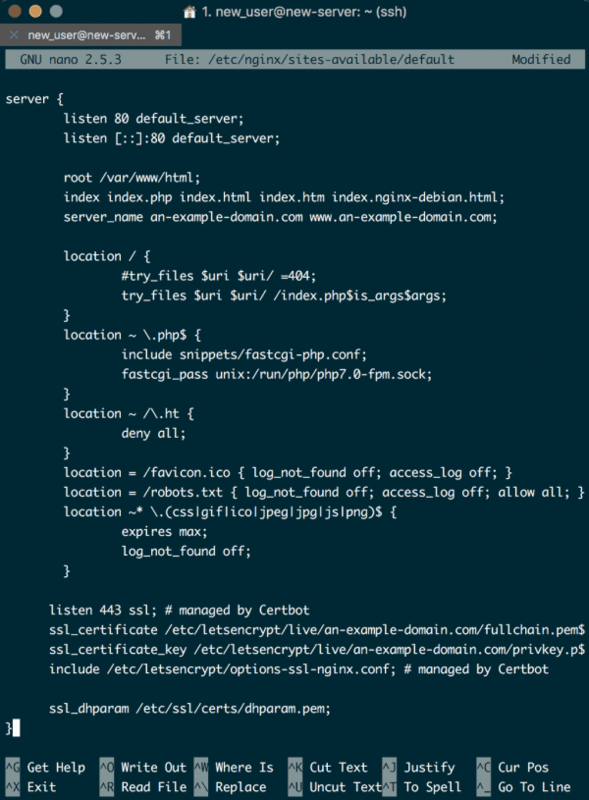 Make sure you close and save the wp-config.php file. Now you’re ready to complete the installation. 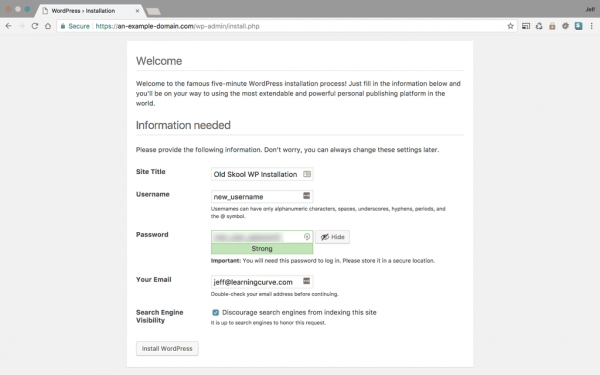 WordPress installed the Old Skool way! 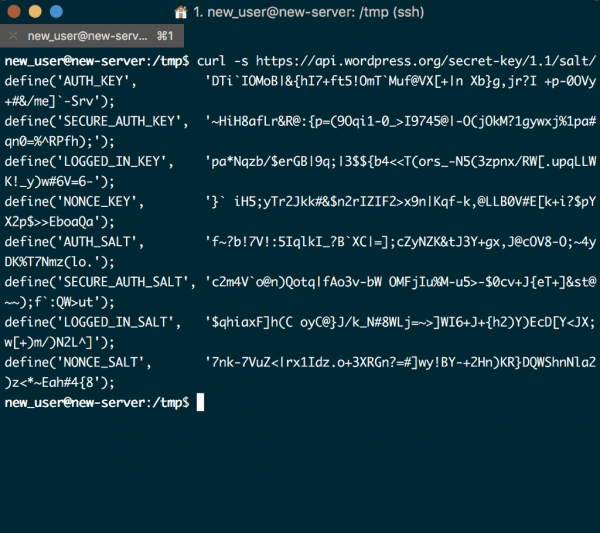 Your WordPress site should be up and running, and secured with an SSL. 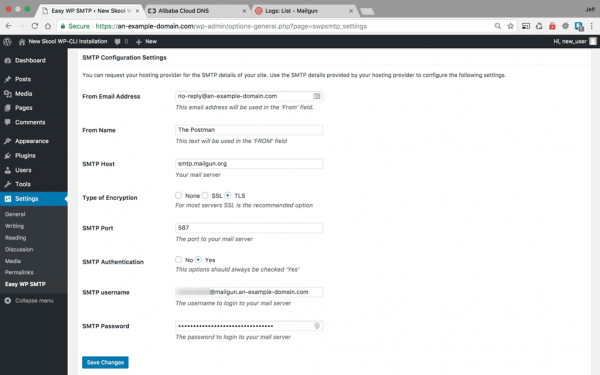 Permissions will need some adjusting to allow you to install and delete plugins and themes, and make other WordPress configuration changes, but we can do that later. 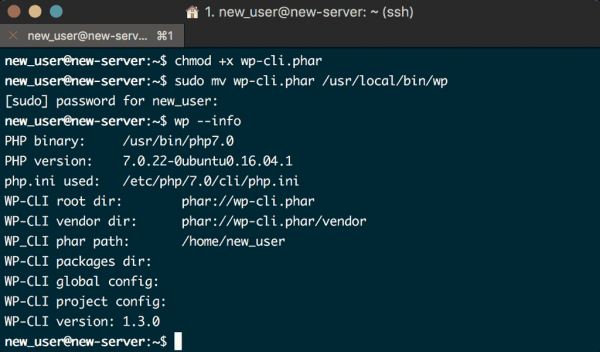 Next we shall install WordPress using the fantastic WP CLI. 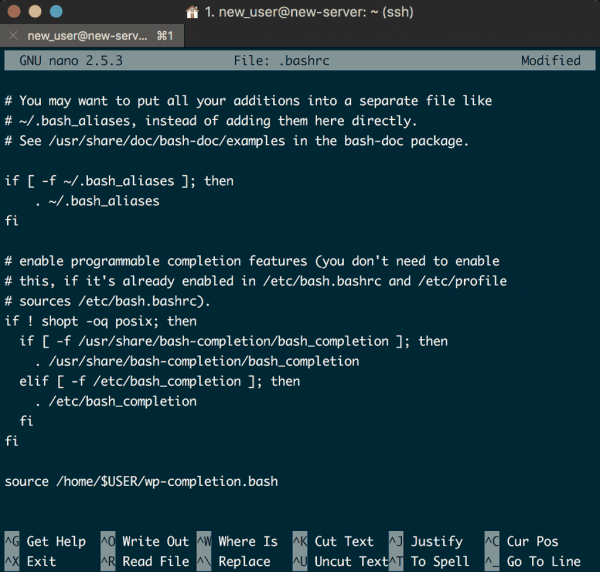 You will want to activate Bash Completion, this allows you to see all the available WP-CLI commands on the fly. Bash completion is now enabled, you can test this by typing wp theme, including the trailing space, and then press tab twice. You will see a list of available commands with the wp theme prompt. You might think that I am downloading the British English version because I am British. Whilst that may be true, it’s also because there is currently a problem with the –locale=en_US US English download. At the time of writing this tutorial downloading the US version throws an error during the unpack. I initially didn’t use a locale, which defaults to US English download, so this error had me running in circles until I found a github error log suggesting using a different language pack, and low and behold, it worked. Since I am British, this is okay, and it’s an opportunity for my US English speaking cousins to learn some proper English – win win! Obviously you should use the database values that you created with MariaDB earlier, and not mine. 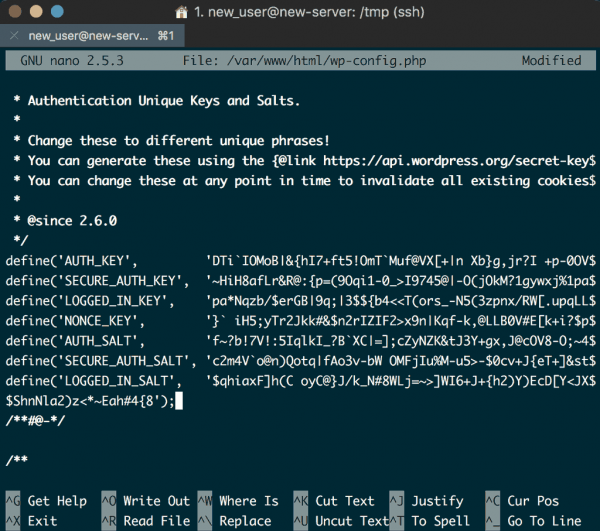 Also notice how we don’t need to bother with the WordPress Salt Key Generator, that’s because WP-CLI does that for us – bonus. 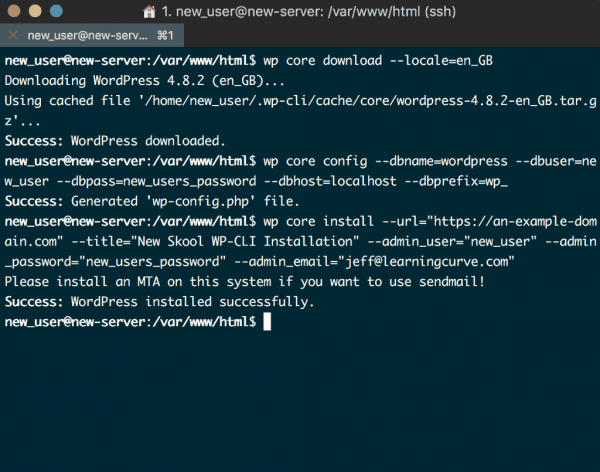 $ wp core install --url="https://an-example-domain.com" --title="New Skool WP-CLI Installation" --admin_user="new_user" --admin_password="some_password" --admin_email="email@domain.com"
WordPress is now installed – WP-CLI for the win! We aren’t finished yet though, remember those permissions? There you go, a fully functional WordPress site with…… hmmmm well, actually, I suppose it isn’t quite functional yet is it? 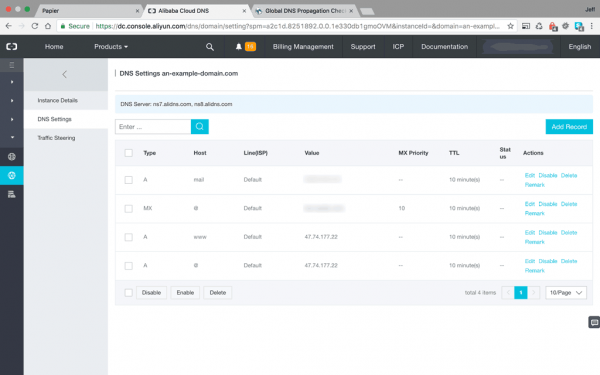 One of the things with cloud hosting, with any provider, is that while you get a fast server you don’t get things like email functionality provided by the hosting provider. Firstly, for your general email, you should either pay for an email service such GApps, Rackspace, or one of the other providers, or you could roll your own email server. I chose the latter for myself, and have a Mail-In-The-Box email server running on a Linode. It is quite a simple email server, there are more functional, and complicated, mail server solutions, but in general I direct most of my clients to use a professional hosted service and this is for my personal business use (I’m in China so the more common email solutions can have serious problems). From a WordPress perspective though, what we really need to sort out, is our transactional emails. We need our WordPress installation to be able to send password reset emails, and the like. To do that, we could install Dovecot, PostFix etc etc on our server. But that would need maintaining and in my case I already have one email server to look after. 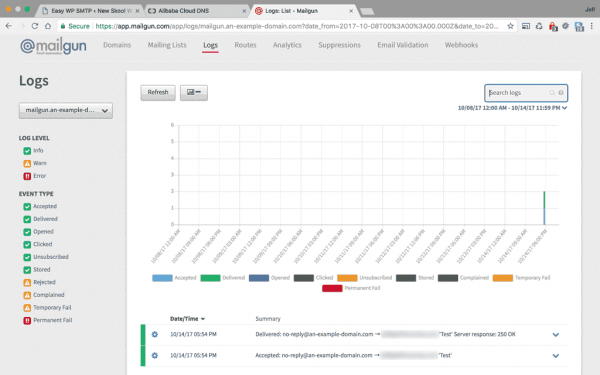 So instead, let’s use an online hosted SMTP service, of which there are several. 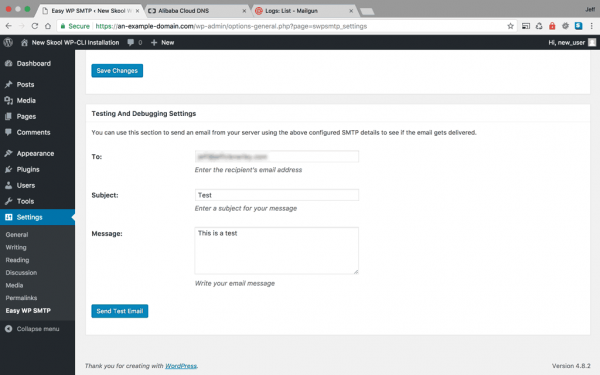 I personally use mailgun so this tutorial will demonstrate how to set their service up on your new install. If you add a credit card to your account, mailgun has a free tier. On this tier you can send 10,000 emails a month, which is more than enough for anyone’s need of a free tier. If you are sending more emails than that a month, then you can surely afford to pay! 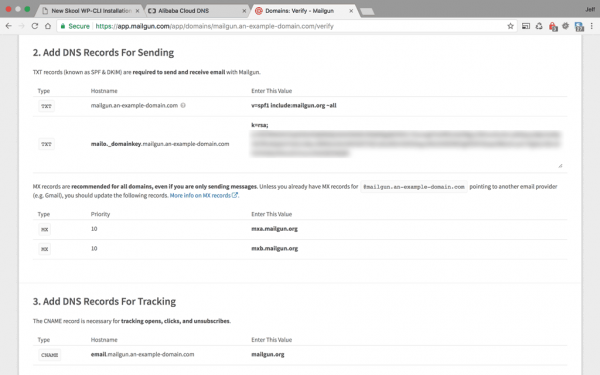 Create a mailgun account at mailgun.com, then login and verify your email address. They have a free tier that doesn’t require you add a credit card, but is restricted to sending mail to at most 5 whitelisted email addresses. On the other hand, if you do add a credit card you can send up to 10,000 emails a month for free. Can’t say fairer than that! 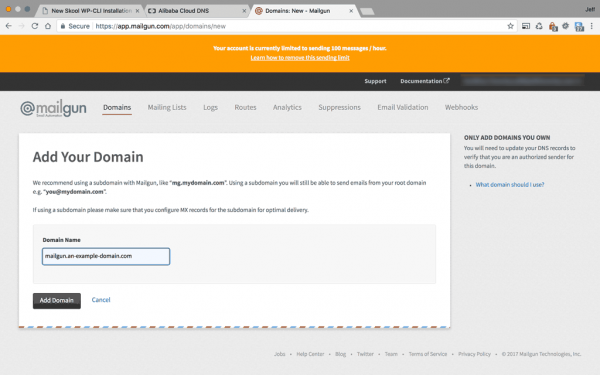 Mailgun needs you to add your domain to their system with a subdomain, they recommend using mg.an-example-domain.com, but I always use mailgun.an-example-domain.com, I prefer to be clear if a little verbose. 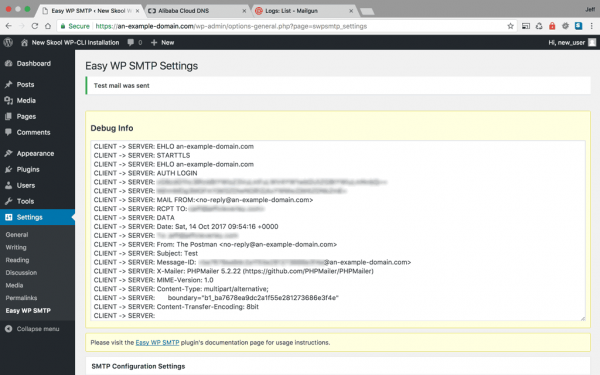 Now we are complete, we have a WordPress site running on a modern, performant LEMP stack, secured with an SSL, and with mailgun transactional emails, all on the Alibaba Cloud! If you have any questions, or noticed any mistakes or poor configuration practices, please leave a comment. Fantastic help throughout! Comprehensive, concise and insightful! Thanks a lot for taking the time to write it all down step-by-step! Happy to help Fred. I’ve corrected the omission of the sudo command when securing MariaDB, thanks for pointing that out. 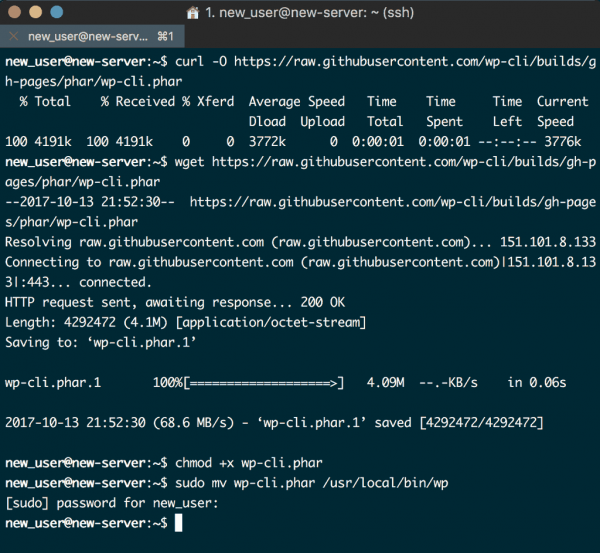 I’ve also added a note in the section regarding installing PHP, asking tutorial users to make sure that all the packages installed properly, following the issue you had with the missing PHP CLI.